Facebook is a stock that I’ve followed for some time. After all, it’s hard to ignore a stock that represents the world’s largest social network and one of the world’s largest companies. Recently, in the headlines, I’ve been seeing just about everyone talking about Zuckerberg losing control of the company if he leaves. But where did these conversations stem from? Does it mean that Zuckerberg is leaving FB? What can we expect to see from the stock moving forward? I’ll do my best to answer all of these questions today. Where Did All The Chatter About Zuckerberg Leaving FB Stem From? All of the recent chatter with regard to what would happen if Zuckerberg leaves Facebook is stemming from a recent filing that was made public. 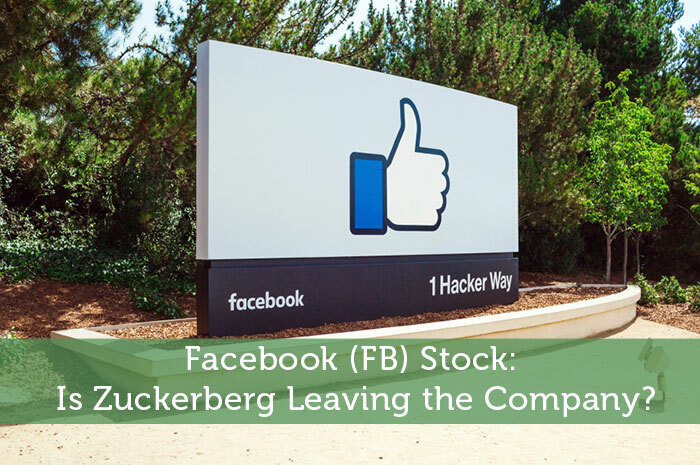 The filing with the United States Securities and Exchange Commission showed a proposal that would cause Zuckerberg to lose his majority voice in the company if he decides to leave his position as the CEO. The filing with the SEC included a proposal, which if passed would cause the CEO’s shares of the company to be reduced to class A shares. The class B shares currently carry the voting power of 10 class B shares. With Zuckerberg’s combination of share, his voting power is currently 53.8%. However, if he was to leave FB, his voting power would be reduced to 14.8%. Is Zuckerberg Going To Step Down? If you follow what most news outlets have to say about the story, you’ll hear that Zuckerberg isn’t stepping down, the board of directors is just preparing for what could come down the line. Well, that’s a bit of a confusing answer isn’t it? The truth is that no one, but Zuckerberg and the board of directors at FB know whether or not he will be stepping down any time soon. There is one thing that could be said here. The board of directors at Facebook is clearly preparing for what seems to be a possibility that Zuckerberg will leave. This could mean that the CEO will be stepping down at some point over the next few months, a year, or even 10 years. Moving forward, I have an overwhelmingly bullish opinion of what we can expect to see from FB stock. The reality is that under the leadership of Zuckerberg, the company has grown to be the world’s largest social network, with nearly 20% of the world’s population using the social network. However, Zuckerberg hasn’t acted alone. While he did quite a bit single handedly, he has also had the opinions and advice of his board of directors to fall back on. Not to mention, the team at FB is one of the most impressive corporate teams in the world. What they have accomplished is nothing less than amazing. If Zuckerberg does decide to step down from Facebook in the near future, the stock may dip. However, I wouldn’t expect to see massive declines. The foundation has been laid, the house has been built, and the family continues to grow. At the end of the day FB is a way of life for many, and will continue to be for the foreseeable future. All in all, the stock will likely continue to grow for the long run. Where do you think FB is headed moving forward? Join the discussion in the comments below!